French Angora Rabbits. All about the French Angora, plus additional angora-related, wool and spinning info. The Angora Rabbit has been domesticated for their wool for over 2000 years. See Angora Rabbits for the history of the angora rabbit, as best as can be determined. The use of French Angoras for wool production in France dates to as early as 1845 in the region of Saint Innocent in Savoy, France. A gentleman named Monsieur Lard developed a large angora herd that provided work for many in St. Innocent. But additionally, he and his wife made it possible for others to start their own angora enterprises. Mr. Lard and his wife frequently gave to the village women and to the poor several pregnant rabbits. They paid by returning half the offspring at 12 - 16 weeks of age. The villagers cared for their own rabbits and reaped the benefits. They sheared the wool, spun the yarn, made garments according to their skills, and sold their products, whether wool, yarn or garment. It was a win win win situation, enabling the enterprising to support the family and the poor to rise out of abject poverty. No wonder France quickly became the global leader of raw angora wool production, holding this distinction until 1965. This is not to say that improvements in wool quality and quantity have not been made. To the contrary, breeders have indeed made great improvements in all aspects of French Angora rabbits. The wool of a rabbit in full show coat has far more height, density and bulk than did angoras of even 80 years ago. French Angoras as recognized by the ARBA weigh between 7 1/2 and 10 1/2 pounds. The ARBA Standard of Perfection awards 35 points to the body, 55 points to wool, and 10 points to color and condition, for a total of 100 points. The body type is more commercial than is the English Angora. This makes 66 total allowable varieties in the USA. English, French and Satin Angoras are accepted in all of these varieties. 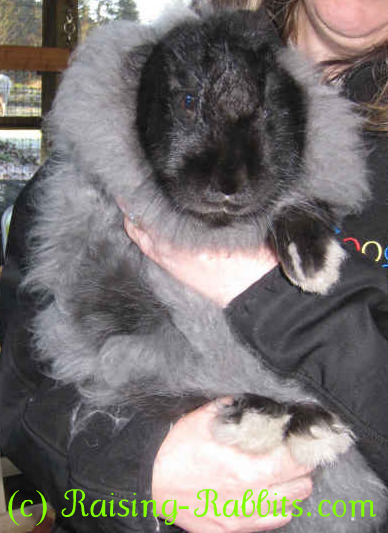 French Angora rabbits are a dual-purpose breed. They have oval-shaped, commercial bodies that provide plenty of meat, plus the wool for fiber. The wool, with its coarse guard hairs protruding beyond the crimped underwool, is usually low-maintenance, requiring minimal grooming. Expect to find no wool on face, ears (other than minor tufting on some), and feet, up to the ankle joint. Their toenails should match if you plan to show the animal. 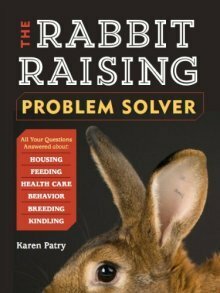 Interested in other rabbit breeds? 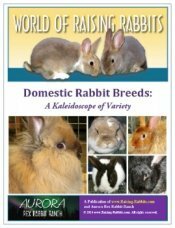 Visit Breeds of Rabbits for a complete description of the e-book, and to purchase it. The wool on French Angoras has a higher percentage of guard hair to underwool than the English Angora. The guard hairs protrude above the underwool, which is heavily crimped. Expected wool length is 3 ½ to 4 ½ inches, though it can grow longer if not harvested. The extra guard hairs simplify the care and grooming, as the coat is far less prone to matting or felting on the rabbit. The fiber qualities are excellent for handspinning. It spins easily, and the yarn is fluffy. French Angoras are fairly low maintenance. Nevertheless, if you’re utilizing the fiber, it is best if you do minor grooming regularly in order to ensure no mats, webs or felting. The rabbits should normally be sheared 2-3 times a year. Regular grooming keeps the rabbits beautiful, maintaining the good personalities and gentleness of French Angora rabbits. Angora wool is 7 times warmer than wool from sheep. It blends extremely well with other fibers. This list comes from www.joyofhandspinning.com, where you can find extensive information on handspinning angora and many other types of wool.